I know that nobody really wants to think about the imminent arrival of the Passover holiday, but face it, friends. Passover is coming. The good news is that today I am reviewing a cookbook that aims to make Passover cooking easy. I know, it sounds too good to be true. But this book proves that it can be done! 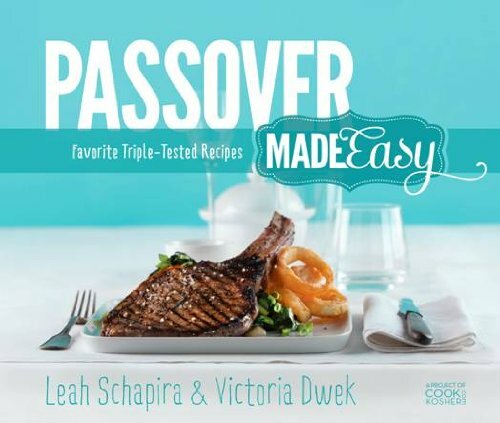 Passover Made Easy is a brand new book, written by the fabulous duo of Leah Schapira (or Fresh & Easy fame) and Victoria Dweck, food editor of a number of top kosher magazines, including the one I write for. The book is a project of CookKosher.Com, and actually features about a third of the recipes by a number of the members, myself included! Leah and Victoria took the recipes, tweaked them and triple tested them, then compiled them into one gorgeous book at a very affordable price! So read what I thought about the book, then scroll down for details on how to win a copy…oh, and a recipe for one of my favorite salad recipes ever! The book is visually gorgeous. The pictures are bright and modern, and beautifully styled, the graphics are amazing, and the whole layout is fun and inviting and makes you want to just dig in! Once I flipped through the book a bit, I was amazed at how none of the recipes screamed Passover. This sure isn’t your bubby’s passover cookbook! There’s a really wide variety of recipes in this book- it even features a brunch and dairy section. (I always thought of that category with regard to passover as scrambled eggs. But no, this book features recipes like Banana French Toast and Matzahroni and Cheese! You all know how much photography in cookbooks is important to me, and this book fulfills my expectations in a *big* way. Not only does every recipe have a beautifully photographed picture to go with it, but there are step by step pictures to guide you through the process of things like plating the Potato and Flanken Kugel, a delicious dish that doesn’t usually look very nice on the plate. Another thing I loved about the book were the cute little anecdotes and stories that come with each recipe. I have to admit that both of the authors are good friends, so I felt like I could hear them talking to me as I read these little stories. But that’s how this cookbook is – it invites you into their kitchens to make Passover together with them. I’m not a big wine gal (I know!) but for those who are, there are wine pairings alongside many of these recipes. Due to the vastly varied customs within the Jewish community regarding which ingredients are acceptable for Passover, some of the recipes feature ingredients that some may not use. However, the book features a Replacement Index of substitutions you can make if your customs don’t allow for all of the ingredients. As someone with rather restrictive customs for Passover, I found this feature especially useful! Most importantly, I loved the variety of ideas and flavors in this book. The biggest challenge for me, every year, on Passover, is to make foods that don’t all taste and look the same. With this book at my disposal, I know I won’t face that challenge this year! Brisket Eggrolls: Do I really need to say anything else?? I had (non-passover) at Abigails a while back, and I’ve been obsessed ever since. But the idea of making a Passover version of such a delicious dish is mind-bogglingly awesome. This is so going on my menu this year. Roasted Tomato and Eggplant Soup: We’ve all established how much I love soup, but this one sounds totally different. I might not be able to wait for passover to make this one! Sweet Potato Pepper Steak: my family doesn’t love the traditional pepper steak, but this looks like a recipe they could really get behind! Pecan Pie with Cookie Crust: everyone loves pecan pie during the year. I am so excited to try this passover version! Anyone who is cooking for passover this year and needs a fresh batch of ideas will find this cookbook ultra useful! Obviously this book is for passover recipes, so if you either aren’t celebrating passover, or are going away (or not cooking for any other reason) this book isn’t for you. My main complaint about this book is that there are a number of recipes that I can’t make due to my restrictive Passover customs. As I mentioned, there’s an index of helpful substitutions, but there will still be some recipes I can’t make. My other issue with this book is that a bunch of the recipes do require an extra step or two, but again, I think that’s more of a complaint about Passover cookbooks and recipes than this book specifically, because there are so many things you can’t buy, so they require extra steps to make them. This is an innovative, exciting, fun and totally beautiful book that everyone who is cooking for passover should own. Not cooking for passover this year? Consider this as a gift for your hosts – that way everyone reaps the benefits! Preheat oven to 475 degrees. Line a cookie sheet with parchment paper. Toss the butternut squash cubes with the oil, salt, pepper and sugar. Bake at 475 for about 30 minutes, until the cubes are tender and cooked through. Preheat oven to 300 degrees. Line a cookie sheet with parchment paper. Combine nuts, sugar, spices and oil on tray. Bake at 300 for 10 minutes. Remove from oven and set aside to cool. combine all ingredients in the bowl of a food processor and process until smooth. Alternatively, place all ingredients in a tall container and blend with a hand blender until smooth. 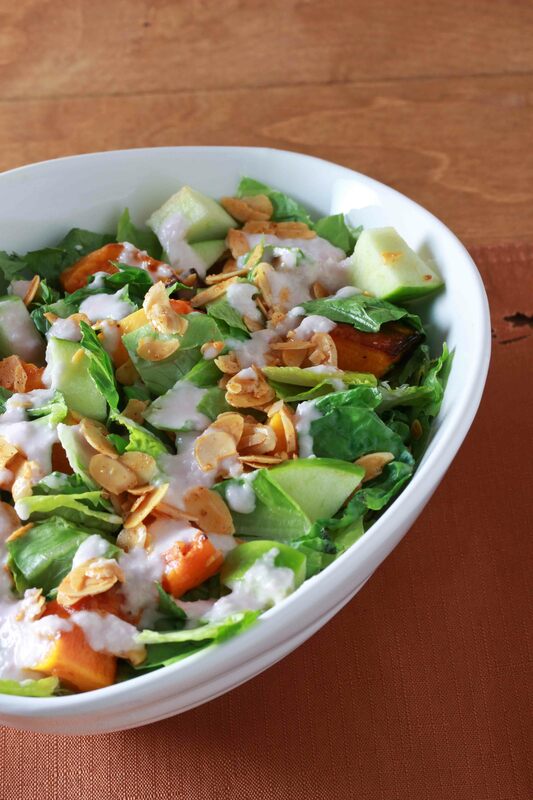 Combine lettuce, diced apple and butternut squash in a bowl. 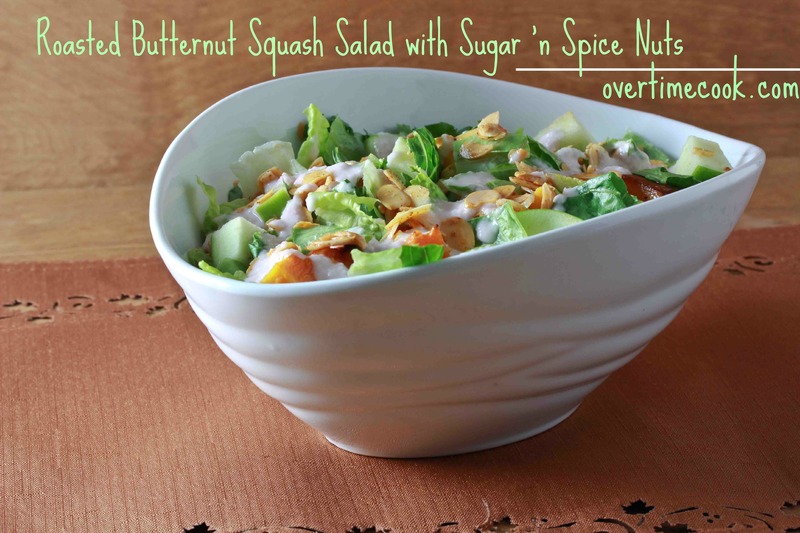 Toss with the dressing and top with nuts. Giveaway ends at 11:59 PM on Monday, March 11th. A valid email address or twitter profile must be provided. Disclaimer: I was sent a review copy of this book, and one of my recipes is featured in it. All opinions are my own. There are affiliate links within this post. Thank you so much for the chance to win this cookbook! I’ve been drooling over it every time I see it! My favorite thing to make for Pesach has got to be my Bubby’s brownie cake. It’s quick, easy, lasts the whole holiday, and everyone loves it. I am already a follower on Pinterest, I love your kitchen inspiration pins! I am already subscribed via email, I don’t see how I’d live without that one! I am already a twitter follower too. i love chicken soup and matzo balls during the seder! they always taste better on pesach! Your blog was among the first few I started following! my moms matzoh ball soup will always be my favorite Passover recipe! My favorite pesach food is shabbos cholent! Ps: I just saw this cookbook and it looked fun !! like you on facebook already! My family’s addicted to butternut squash kugel. This recipe will be a nice change! I get your emails. Love ’em! My newest favorite for pesach is a pesadik blondie recipe. Yum! chocolate mousse pie!..I like you on facebook and get your emails…thanks! Jerusalem mix is 1 of our favorite main dishes! We eat it all yr round too! My mom’s pesach crepes….they can be filled in so many ways or just used to make a wrap or sandwich. I follow you on ur blog! My favorite pesach food is mushroom crepes! I look forward to that all year round! I follow you on face book!!! And my favorite Passover dish, now this is a hard one, maybe the chicken my mom makes for the seder night. Maybe more nostalgia than flavor, though. I love my mother’s pesach blintzes/crepes. I love to make my mother’s recipe for cold borscht. It is the most refreshing drink and when served in a beautiful goblet, it has the most luxurious fuschia color. It makes me feel connected to my mother and to my grandmother, whose recipe it is. Of course it doesn’t only have to be made on Pesach. It makes a great summer cold soup. My mom makes real gefilte fish- ground whitefish and pike stuffed in carp. YUM! Potato Kugel:) I like you on facebook. another charoset fan- but the sephardic type, from medjul dates. my mother makes huge containers of it. wont touch the ashkenazi sort. Matzo balls made with whole matzahs (not matzah meal) and fried onions and a dash of ginger…like my grandmother used to make. Also my niece makes a killer chocolate mousse pie using those nasty canned macaroons, but in this case they taste great. I already subscribe to the email. Thanks! pesach brownies are the best! Favorite Pesach Dish! My Knaidlach – growing up non-Gebrokts, I love the freedom that comes with marrying into a Gebrokts family! Thanks for another GREAT REVIEW. I already follow you on FB! Of course on Pinterest – got many great ideas from you there! And signed up for email! U know I liked on Facebook! Long time ago! Now liked on Pinterest. What else to do to win???? I just subscribed to your email- I love your blog! My favorite pesach dish is my husband’s chremslach! My favorite Passover food is guacamole. (Seriously.) I’m also a big fan of charoset. email follower, will definitely try the recipe, thanx for you good humor! i subscribed via email, facebook, twitter, and pinterest!! i love my aunt’s recipe for mandel bread, we usually need to make a batch daily, and my grandma’s recipe for eggrolls…. mmm! thanks for the opportunity. i have been making so many of ur recipes lately! My favourite passover food is one that isn’t a real traditional food, but I love it because it reminds me of the passovers I attended back in school: my best friend’s mum (who held it) loved deviled eggs and so she always served deviled eggs. It’s a nice memory for me! I love eating lots of salads on Pesach. Especially with interesting lettuce. My favorite Pesach recipe is my meatballs. My favorite Pesach dish is definitely a sweet matzo brie with cottage cheese, cinnamon, and sugar – YUMMMMMMM!!!!!!!!!!!! my favorite pasover food is the pesachdiga lukshen my mother always always used to make. It’s like a blintz cut up into pieces! This recepe looks amaizing!!!! i like you on facebook!!!! My favorite pesach recepe would have to be lukshen. This book looks amaizing!!! Liked you on FB, subscribe to your emails. My favorite recipe is potato knishes. They are easy and look like they took you forever. I am already subscribed :). I saw the cookbook, but my customs are probably even more restrictive than yours, so I didn’t think it would be worth buying it. But if I’d win it, it would be worth it even if I could only pick out a few recipes! I love cooking gratins on Pesach. I make an AWESOME Pesach Farfel Kugel, with mushrooms, onions and celery. It tastes just like stuffing! I liked you on FB. My favorite recipe for Pesach is “chugel” aka yapchik. Thanks for bringing this cookbook to my attention. Passover brisket eggrolls?! I must get that recipe! My favorite passover foods are kugels; sweet matzah kugel and savory potato kugel. My family waits all year for my passover mandel bread. I think my favorite Pesach dish is matzoh brie, with cinnamon and sugar. Pesach is normally about dietary restrictions, but I just remember it being such a special morning when my mom would teach us how to cook it. It was a really cool change from cold cereal. It became about family and dietary additions. Subscribed to emails. Can’t wait to start getting them. Favorite passover dish is homemade egg noodles. Never mind the cholesterol! We rarely make schnitzel during the year, but always on Pesach. Funny, I know. But we all really look forward to that pesachdik schnitzel! I really like that even though you were given this cookbook, you included your dislikes about it! It allows me to believe in your honesty about all the positive comments. I follow (and retweet) you on Twitter. I just started following you on Pinterest (with my different Pinterest name). I follow your every recipe! My favorite Passover dishe(s) are anything with roasted veggies, and home-made egg noodles! my favorite pesach food is chicken soup seder night, for some reason, it always tastes better! 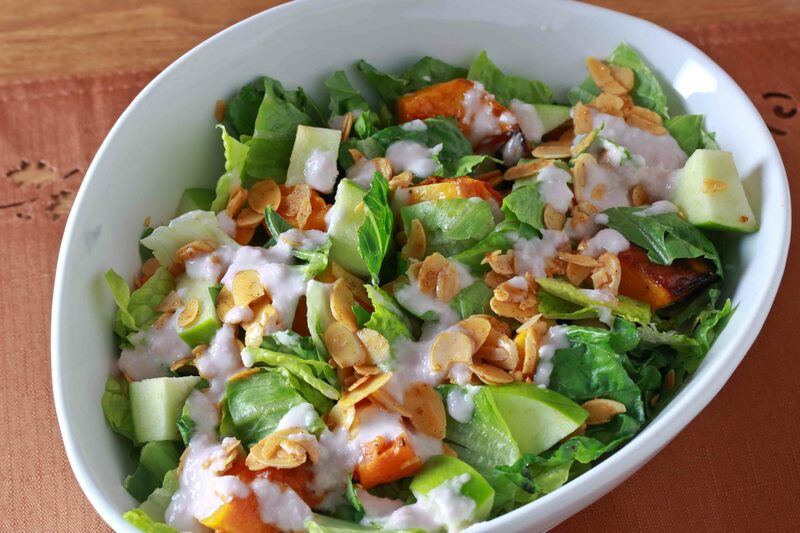 that salad looks great – would love to try it! I really love just about everything I make for Pesach- Everything is just so fresh & so simple & good. If I must name a fav it’s probably the nut brittle I started making one year when my nieces came by in the afternoon & I had no nosh (We are really restricted in what we buy) Toasted some nuts ifn a non-stick pan then melted some sugar over it, poured it out on foil & let it cool. Now everyone waits for my Pesach Candy. I receive your emails, am now following you on twitter and pinterest. love my mother’s pesach cakes! I like matzah pizza best! I like matzoh pizza. I’m the only one in the family that does. I follow you on Pinterest (as ohyoucook). I follow you on twitter (as @ohyoucook). My mom taught me how to make matza brei and now I make it for my kids! I subscribed, cant wait to start receiving them! Favorite Pesach dish is matzoh schnitzel! I already follow you via email ! my favorite Pesach dish is homemade rolls. absolutely delicious, especially when theyre still hot and u put on butter, and it melts.. yummm ….. and of course chocolate chip cookies and jelly thumbprint cookies! Hi there! I follow you on instagram, read your column in ami religiously… you are awesome!! My favorite is Matzo Ball Soup! Following you on Pinterest now!! (is that supposed to be capitalized?) Thanks for the opportunity! I love matzoh with salted butter or cream cheese. I always look forward to homemade pesach applesauce. I love your recipes, and your pictures are fantastic! Already subscribed (and love!) your emails! Thanks for the opportunity to win the cookbook. Anything that makes Pesach easier is a help. I get your emails & follow you on Facebook, I love cooking different foods for the Seders and for Pesach. My mom’s famous kneidlach! Look forward to that on pesach! My favorite pesach dish is charoset-I could eat it with any meal! I love making blondies. I have a recipe that keeps getting passed down! My best dish on pesach is homemade matza Brie with jam/jelly!!!! i like overtime cook on fb! also, I love fried chicken coated in matzah meal! My favorite pesach dish are my special blondies! I just signed up for your emails – nowi don’t have to stalk your blog for the next new recipe! Favorite Pesach dish is my mom’s apple crumble! oh, and i subscribed to your e-mails. wanna win this book! My favorite Pesach dish is the savory matzoh Brie with salt and pepper and sometimes I will fold in sauteed mushrooms and onions. I also love the plain ol matzoh, butter and salt. I am a (HUGE) fan on Facebook! My favorite passover food is chocolate toffee matzah crunch! favorite dish?? your unbreaded cauliflower now get to work and make a pesach one! 🙂 then i can comment that its my favorite pesach dish! Harosset is my favorite spread for pesach! I follow you on Facebook and on pinterest! Love your blog, always enjoy reading and making your recipes! I liked, followed and subscribed. It’s my first year making pesach, and my parents are coming, I could really use and would really love to win this cookbook! …and my favorite Passover dish-I know the suspense is killing you- is matza pizza- better than real pizza I reckon! Apple Kugel all the way!! YUM!! Already get your newsletter and love it!